Want to shave under shower. Few hidden things you should know. What are those? Hold your imagination, stick with me. If I say 100% waterproof is just a tag, you may be surprised. Believe it or not, but that’s the ugly truth. This is what I found form my 5 years experiment with electric razors. Most of the electric shaver comes with this tag but when you will go for shower shaving, you definitely discover the truth. Note: you can use those waterproof shaver for wet shaving not for shower shaving. Disappointed! Please give me a minute I’m going to come up with solution. I understand how much you love to shave while in shower. To make you happy, Braun released 3 razors, those you can use in shower. Unfortunately none of the brands (Panasonic, Remington, Wahl etc.) succeeded to make their contribution on this issue. I hope now you can realize that, before you make your decision you should carefully read the package. To keep you on track I’ve come up with exclusive buying guideline. You’ll also find reviews of my best picks. So what are you waiting for, explore yourself and make your shower shave amazing. Why most of the waterproof electric shaver are not suitable for shower shave? What makes braun 799cc better choice than the rest? 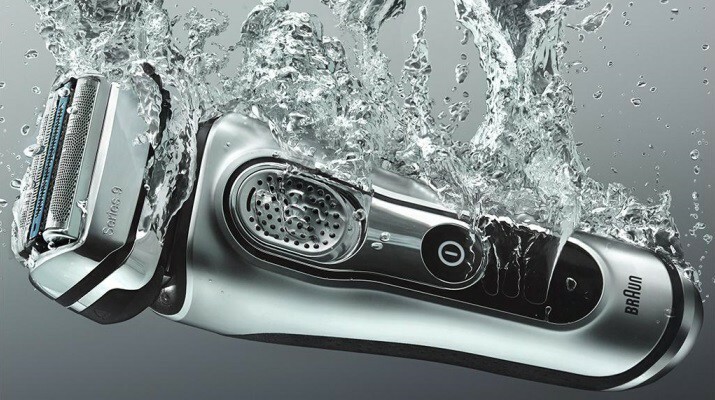 The Series 7 wet/dry shaver is a league of its own. And we say that not just because of the performance that Braun delivers with this one. It is the innovation that really gets to you. You get the innovative pulsonic technology with 10,000 micro-vibrations that work very hard to capture more hair with each stroke. You get to choose among 3 distinct modes of personalization for each shave. The Active-lift senses, captures and cut hair that lie flat on skin. And that neatly wraps up the list of technology-oriented features. The flexibility of the entire system is where Braun has shown once again why they are the pros as innovation. The way the shaver adapts to your face is simply amazing. You cannot help notice how smoothly the razor glides down your facial contours, never missing contact with the skin. The Series 7 is like an improved version of the 790cc from the same manufacturer. If you liked the 790cc, you will like this even better. 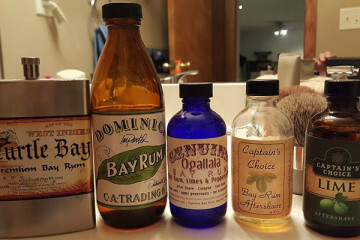 The best head in wet/dry shaving. Commendable under-nose and sideburn action. Head lock mechanism may take time to adjust. 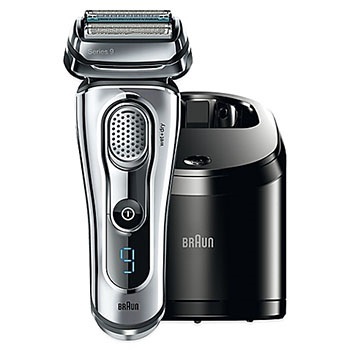 The Series 9-9095ccis a wet and dry shaver that has been the flag-bearer in dual-mode shaving for Braun for quite some time now. You know you have a complete set when the device charges, cleans, lubricates and becomes bone dry with a simple button function. The cleaning is so efficient you almost feel like you are using a new shaver every day. It is more hygienic than tap water and is noticeably very comfortable on the skin in general. The drying capacity of wet/dry shavers is really important if you are a regular shower shaver. On that note, the Braun Series 9 dries in real quick time with a built-in fan. The programs are selected intelligently and this ensures optimal consumption of fluid. The charge station is one of the best you will find in the category. It is the only one in the world that comes with a 5-action alcohol-based cleaning station. 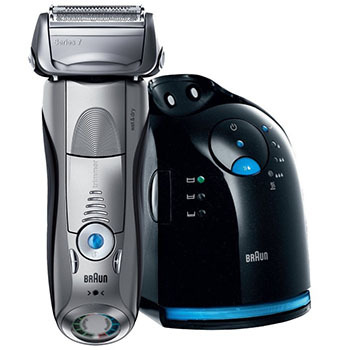 >>Best deal I found on the Braun 9095cc. Clean, lubricates and charges automatically. 5-action alcohol based cleaning process. In-built fan for quicker drying. Cleaning pack lasts a month. Overhyped cleaning function; just does the job. Less accurate than a Braun 7. 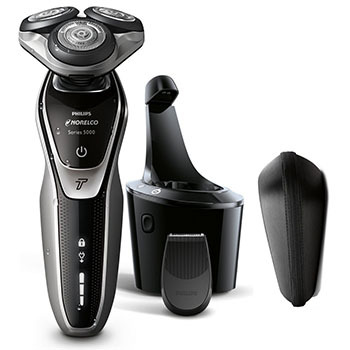 The 5700 Norelco electric shaver comes with a turbo-poweredshaving facility. You will find due use of this feature if you have dense beard. The performance goes up with a 10% increase in power. The multi-precision blade system of the device raises and then cuts both short and long hairs with equal efficiency. 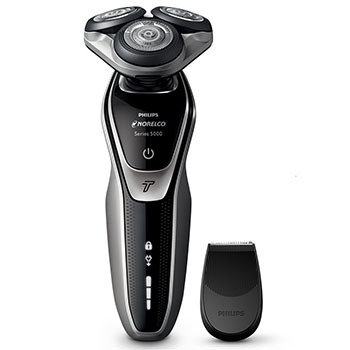 The device comes with a 5-direction flex head that are capable of rotating in five different directions that give a closer shave every time. 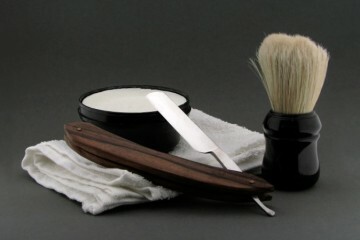 The device is hailed as one of the most effective wet and dry shaving equipment available. The Aquatec Wet and Dry shave gives you refreshing dry and wet shaves at the same time. You will also make good use of the Smart Clean mechanism of Norelco that charges, cleans and lubricates at the same time. Unlike most other wet/dry shavers, the cleaning system is free from alcohol. But it still manages to do the job 10x better than water. Turbo shave for denser beard. Click trimmer for sideburns and mustaches. 45 minutes on a single charge. Low quality blades in shaver. Cleaning system not compatible with other Norelco models. The Norelco series is always rich on features. So we let’s quickly wrap up the features and then tell you about the usability of the shaver. The turbo mode shaves you with 10% more power. The multi-precision blade system allows for the blade to lift and cut the beard simultaneously. The super-flex head is capable in moving in five directions to give you a fast and close shave. There is a smart-click trimmer that comes for the sideburns and mustache. The LED display displays batteries at all three levels and that is really useful for a change. You will also like the 45 minutes of cordless shaving performance that the device generates almost every time. There is a one touch button for opening and easy cleaning. You attain superior convenience in shaving both wet and dry with the Norelco 5500. Choose the dry shaves for a quick change or the wet one for a more comfortable and foamed experience. Turbo mode offers 10% additional power. Flex heads move in 5 different directions. Click trimmer for mustache and sideburns. Repeat passes needs for closer shower shaves. Turbo barely makes a difference to shave quality. 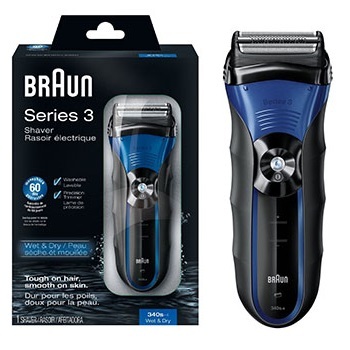 The 3series 340S-4 from Braun is a real quick wet/dry shaver that makes things easier on the go if your budget is less than $50. You get enhanced performance on 3-day beards, courtesy the FreeFloat system. The SensoFoil technology gives you closer and more efficient shaves. And the Triple Action cutting system of the product takes due care of both long and short hair at a go. The SensoFoil technology is the real takeaway here, as it promotes easy shaves by cutting more hair in an efficient manner. The Triple Action cutting system is capable of cutting longer hair just as subtly as it works on short hair. No prizes for guessing it is 100% waterproof and can be used in shower. You may use it with gels and shaving foam inside the shower with equal ease and efficacy. The LED display of the device helps you stay updatedon the charging status and battery level of the device. The powerful rechargeable battery works well with additional requirements. Precision trimmer for long hair. Could be unnecessarily hard on the face. The two are not the same thing really: a waterproof razor typically means water will not harm your razor. You can keep the razor submerged in water for a check. But the goodness does not necessarily translate into great shower shaving antics unless the manufacturer has built the shaver for the purpose of shaving inside the shower. That requires dedication to technologies that help you achieve better shaves under the shower, with lesser difficulty. While most waterproof electric shavers do not take any threat from water, they also do not show any distinctive affinity for performance under shower. The 799cc comes across as with the quintessential Braun Series 7 effect, with some of the features even eclipsing the 790cc. It is not the cheapest wet/dry shaver around the corner and it makes up for that with sheer innovation. Unlike any other device we reviewed in this category, it brings you three distinct modes for personalization. And you will find distinct uses for all these modes, unlike the 18-mode mumbo-jumbo of other shavers. The 799cc easily has the most effective shaver head in the category. It literally fells like the blades are talking to the skin as it follows the contours of your face. Consider choosing a shaver that listens both to the shower and to your skin under shower. Only then you close to making a choice that suits the terrain.